This sounds like a good way to spend the bank holiday - with The Fat Bear (not a real bear as far as I know) and their Cajun Crawfish Boil. It's from 5pm - 8pm too, so it lets you get home in good time to prepare for the dreaded return to work. 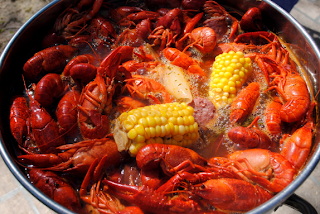 "The Fat Bear invites you to join them for a good ol’ fashioned Crawfish boil – known as crayfish to us British folk, and “Crawdaddies” if you want to go really out there. A crawfish boil is an all-you-can-eat extravaganza – eat as many of these delicious little lobster-like creatures as you can handle, plus all the classic trimmings like corn, potatoes and sausage. You’ll need plenty of napkins (don’t worry we’ll provide them), and clothes you don’t mind getting a bit dirty – eating crawfish is a serious and messy business; thankfully it’s also great fun and scrumptious to boot. As an added perk, you’ll also be helping the endangered indigenous species of British crayfish – their evil but delicious American cousins are clogging up the waterways and killing off the locals. It’s win-win-win, except for those sweet meaty invaders from across the Atlantic … they’ll get what’s comin’ to ‘em."